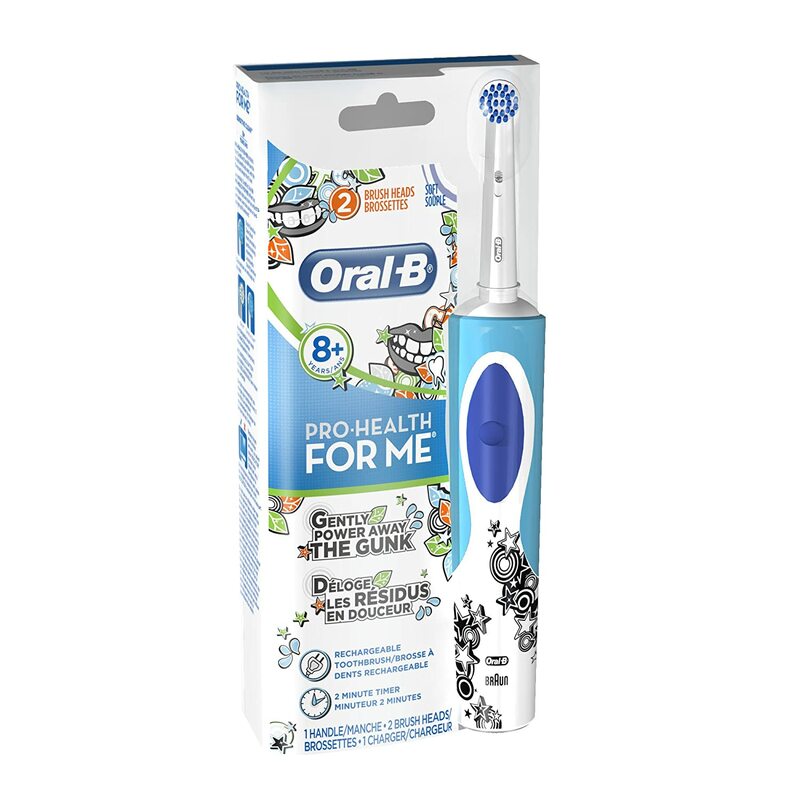 I have been sold on electric toothbrushes since I first started using them, so when I was asked if I would review a complimentary Oral-B Pro-Health for Me Rechargeable Toothbrush, I jumped at it. Anything to get my daughter brushing better will be good. She is at that tween age and has many adult teeth, so good oral hygiene is more important than ever. What's really nice is that the handle is waterproof and has fun designs that she likes. I like the built-in two minute timer--the time dentist recommend for brushing. The brush head provides a gentle, but thorough brushing experience. When the brush gets old, you can purchase new replacement heads. In fact, multiple children can use the same handle, just have them switch out heads. Both my girls are using this toothbrush (with different heads, of course) and love it! They say their teeth feel really clean after brushing. I think the the power toothbrush has to do a better job than they would do manually, so I am happy. America's ToothFairy has sponsored this post. They work hard to help kids in need and have provided the information below. I hope you will take the time to read about their program as well as some great Halloween tips. Trick or Treat with America's ToothFairy! America's ToothFairy has something for everyone! Younger kids will love the America's ToothFairy Kids Club ! It is FREE and members receive fun educational activities, tips and a personalized letter from the ToothFairy! Did you know that there are MILLIONS of at-risk kids that can't sleep at night, eat properly or even concentrate in school because of painful tooth decay? Without the financial resources for dental care or even a toothbrush or toothpaste, these kids find themselves caught in a downward spiral of pain and humiliation, from getting bullied in school to enduring an agonizing toothache on a daily basis. Don't let tooth decay ruin a kid's life! This Halloween, transform a kid's tears of pain into a healthy smile and hope for the future by participating in Trick or Treat for America's ToothFairy. Kids can get involved too and receive fun stickers and a certificate recognizing them as an Official ToothFairy Helper by the ToothFairy herself! Click here to download your great Halloween games, a song, and a calendar filled with super spooky fun activities for the entire month! Tips for a Health Halloween from America's ToothFairy! Make this year memorable and sweet without all the sugar with these fun tips for a healthy Halloween! Give 'em a treat without the sweet! Hand out sugar-free candy, toothbrushes or fun little toys to trick or treaters! Make sure your child has a healthy meal before Halloween festivities to avoid snacking and a sugar overload! If you are hosting a party, use healthy foods to make fun treats that the kids can enjoy. With a little fruit, some paper plates and toothpicks, children can create their own Monster Face. Melonballs or grapes make great monster’s eyeballs, simply spear the melonballs with the toothpicks and poke through the paper plate. For the monster’s nose, spear strawberries or orange slices, and for the monster’s smile, a banana will do just fine! For a healthy smile year round, remember to brush, and floss your teeth twice a day and visit your dentist once every six months! For children ages 6 and up, use a fluoride rinse. Trick or Treat with America's ToothFairy this year and help raise awareness and support to protect young smiles and help kids in need! Disclosure: I received an Oral-B Pro-Health for Me Rechargeable Toothbrush and heads to facilitate this review. As always, this post contains my honest opinions.